"Yaki Boud, Yaki na Boud." That means, "Once there was, and once there was not" An old woman lived alone with her big white dog. One morning, she decided to go up and over the mountain to visit her granddaughter. Her dog would have gotten into trouble if she had brought it along, so she left it home. "You stay here, and take care of the house," she told the dog. Then off across the mountain path she went. As she walked along, she passed a cave .She heard a strange voice inside the cave. She tried to hurry past the cave, but just as she got beside it, OUT popped a djinn! Some djinns are invisible. But this one was ugly and looked like an ogre. Some djinns are nice, but this one was mean. Some djinns give away wishes. But, this one did not! He was mean and looked at her with horrible looks, and he was licking his lips. Some djinns will leave people alone, and let them go on their way. 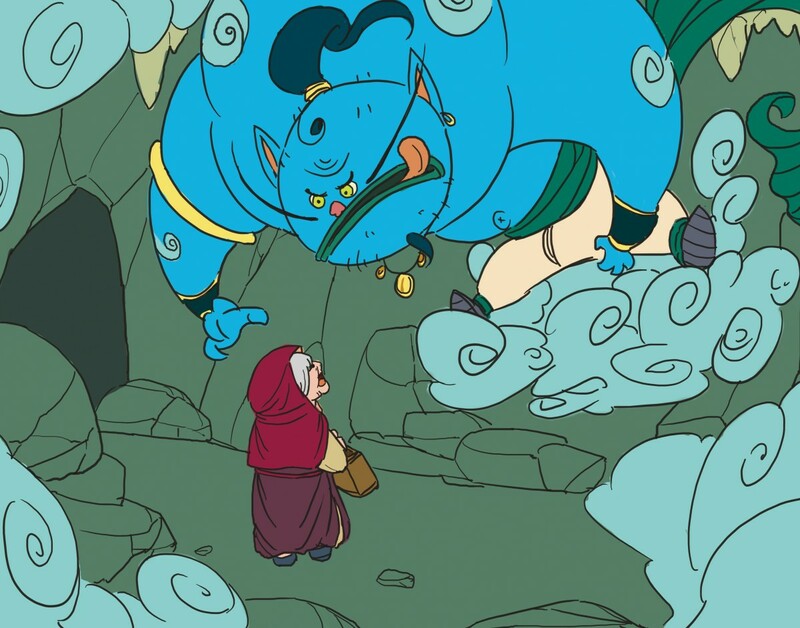 But, the djinn stepped into the path of the old woman and said. I am hungry!" The old woman said, "I am hungry too! I am going to my granddaughter's home because she makes good cakes and other food. What are you going to eat?" "I am going to eat you!" shouted the djinn in a most terrible voice." Then he laughed in a way that the old woman did not think was funny. "Ha, ha, ha, ha!" "I would not make much of a meal for you," said the old woman. "Why not let me go up the mountain to my granddaughter's house? This is the only path back down the mountain, so I must pass by here again. Why not wait here until I come back nice and fat?" "That's exactly what I will do," said the djinn. Hurry up and get fat! I will wait for you right here, and will eat you when you come back!" The old woman walked until she came to the house of her granddaughter. Her granddaughter was so glad to see her that she fed the old woman cakes and kebabs and flatbread and treats of all kinds. By the time the old woman was full, her cheeks and her belly were much rounder than before. The old woman told her granddaughter, "I really don't want to go home, but I left my big white dog alone. He will be getting hungry. But, I am afraid to go past the big cave beside the path on my way home. A djinn is living in the cave. He is not the nice kind of djinn that gives away wishes. He is the hungry kind of djinn that wants to eat me for his dinner." "Oh, Grandmother," said the girl, "I have an idea." Then the granddaughter cut open the top of a giant pumpkin that grew in her garden. She hollowed out the pumpkin. "Get inside, Grandma, and I will put the top back on. You can roll home inside the pumpkin. The djinn will never recognize you. Besides, djinns don't like to eat pumpkins." The old woman got inside the pumpkin. Her granddaughter pushed the top down tightly. The granddaughter rolled the pumpkin to the edge of the path and gave it a gentle push. At first, the pumpkin rolled slowly along. As it rolled, the woman sang, "Roll my pumpkin. Roll my pumpkin. Roll my pumpkin, roll along." "Roll my pumpkin. Roll my pumpkin. Roll my pumpkin, roll along." "Bumpity Bump Bump goes my pumpkin, Bumpity Bump Bump, roll along!" The djinn saw the pumpkin rolling down the path. But djinns do not like pumpkins. At first he left it alone. He was looking for the old woman. The path became steeper, and the pumpkin rolled faster. The old woman sang louder and faster. "Roll my pumpkin, Roll my pumpkin, Roll my pumpkin Roll along! Roll my pumpkin, Roll my pumpkin, Roll my pumpkin Roll along. Bumpity Bump Bump Goes my pumpkin. Bumpity Bump Bump Roll Along. Bumpity Bump Bump Goes my pumpkin. Bumpity Bump Bump Roll Along." The djinn kept watching the pumpkin. He heard the singing. Then he thought, "Pumpkins cannot sing. That old woman is trying to fool me." He sat on his tail and held out his big bare feet and stopped the pumpkin as the old woman tried to roll past his cave. "What are you?" asked the djinn. "I am a singing pumpkin," said the old woman. "No you are not," said the djinn. "You are that old woman that I promised to eat." "I am a singing pumpkin," said the old woman again. "Please push me down the hill and let me go." "Pumpkins cannot sing," said the djinn. "Come out so I can eat you!" "I cannot come out," said the old woman. "Yes, you can," said the djinn. "No, I can't," said the old woman, "Until you say the magic words." "Ok," said the djinn, "Please and thank you." "Those are nice magic words. But, you must say other magic words before I come out, said the old woman. "You must say Commmmear Maaaaahyeee Beeeg Whaaaaeeet Doooog." So, the djinn said, "Commmmear Maaaaahyeee Beeeg Whaaaaeeet Doooog." But the pumpkin did not open. The old woman did not come out. "It did not work, and I am still hungry," said the djinni, shaking the pumpkin. "You must say the words louder and faster," said the old woman. So the djinn said the words again, louder and faster. "Commmmear Maaaaahyeee Beeeg Whaaaaeeet Doooog." Still the pumpkin did not open. "You almost have it right," said the old woman. "Say the words louder and faster one more time, and I know I will be able to come out of the pumpkin." So the djinn shouted, "Come here my big white dog!" Then he heard, "Woof, woof, woof." The big white dog came running up the mountain and chased the djinn far away. Then the dog gave the pumpkin a push and it rolled the rest of the way home with the old woman still inside. "Roll my pumpkin, Roll my pumpkin, Roll my pumpkin Roll along. Roll my pumpkin, Roll my pumpkin, Roll my pumpkin Roll along. Bumpity Bump Bump goes my pumpkin. Bumpity Bump Bump Roll along. Bumpity Bump Bump Goes my pumpkin. Bumpity Bump Bump Roll along,"
And when they got home, the old woman came out of the pumpkin, safe and sound. Note: Dr. Lockett has recorded this story on his album Tales and Fables: East Meets West (2008). Dr. Mike Lockett is an educator, storyteller and children's author from Normal, IL. Dr. Lockett has given more than 4000 programs across the USA and as far away as eastern Asia. Contact Mike by writing to Mike@mikelockett.com in order to book him for a storytelling program or young authors program or to inquire about purchasing his books and CDs. More stories and information about storytelling can be found at www.mikelockett.com. In 2016, Dr. Lockett performed this story at the 18th Annual Tehran Storytelling Festival.